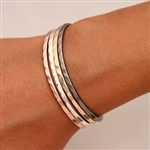 This is a new thinner style of our mixed metal cuff bracelet. It has richly hammered niobium sides contrasted by a smooth polished tube of rose gold filled in the middle. This new style is the same width as our other thin (351) style bracelets, which is slightly thinner than the original bracelets with tubing. 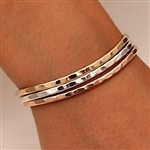 In this group of stacked thin cuff bracelets you can see how the graceful curve is repeated. You get the play of light dancing across multiple hammered bracelets as well as the different color of the metals plus the nice feel and look of stacked cuff bracelets. In this group of stacked thin cuff bracelets you can see how the graceful curve is repeated. You get the play of light dancing across multiple hammered bracelets as well as the different color of the metals plus the nice feel and look of stacked cuff bracelets. The bracelets in this group consist of 14K Rose Gold Filled, Sterling Silver, 14K Yellow Gold Filled, and Niobium (gunmetal.) Each bracelet is 3mm wide. 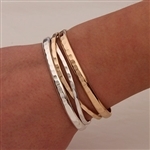 In this group of 6 stacked thin cuff bracelets you can see how the graceful curve is repeated. You get the play of light dancing across multiple hammered bracelets as well as the different color of the metals plus the nice feel and look of stacked cuff bracelets. There are two 14k yellow gold filled, two 14k rose gold filled, and two sterling silver.